﻿ How to take care of your Aikido kimono? Home » Questions about Aikido » How to take care of your Aikido-gi? At first glance, the answer is obvious: washing, drying, and ironing. However, if you want your kimono to be in use for as long as possible and you want to look fresh and neat at Aikido trainings, you need to know how to take care of your kimono properly. As you can see, the first two factors depend on the chosen brand. It is extremely difficult to say in advance anything definite about the products of different manufacturers. So we can give only one piece of advice: when you buy a kimono, always ask the seller about the fabric's properties. 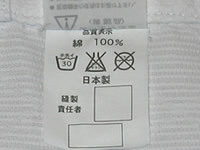 As a rule, the care labels from all manufacturers recommend to wash the kimono at a temperature not exceeding +30°C. If there has been anti shrink cloth trim, the aikido-gi will not only retain its original size, but will be in use for you as long as possible. Washing at a temperature higher than +30°C will result in the kimono shrinkage: the higher the temperature, the more the shrinkage. 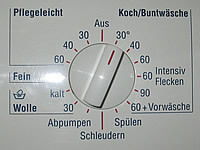 This implies that shrinkage will be maximum at a temperature of +90°C. Thus, if you have bought an aikido-gi one size bigger, then you can adjust it to your right size by washing it at a higher temperature. You may need to perform this procedure several times. Pay attention to three important details. The kimono never shrinks equally in all directions. The shrinkage degree in the specific direction depends on the braiding and the weaving yarns. For example, the jacket (uwagi) generally shrinks more in width than in length. A high temperature causes intense fabric aging and significantly reduces the kimono durability. Please keep in mind that you break the rules of the product care and do it at your own risk when increasing the washing temperature. How often should kimono be washed? 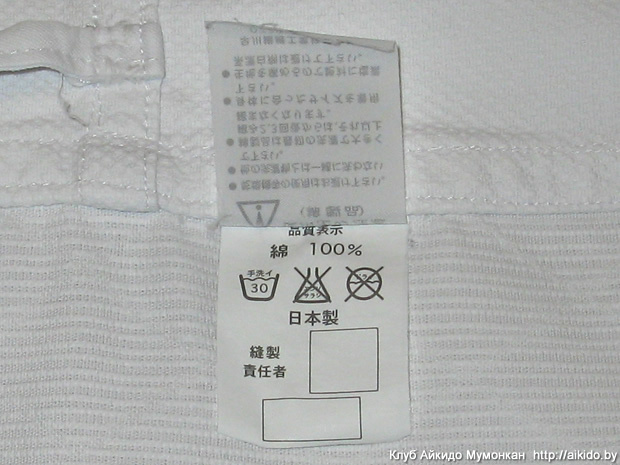 You are recommended to wash your kimono as often as possible from the hygienic point of view. In general, the frequency of washes depends on the intensity of your Aikido trainings, an individual sweating, and on the kimono overall impurity. So, since each washing in a washing machine shortens the aikido-gi life inevitably, we recommend you to approach this issue individually. It is not necessary to put the kimono in the washing machine after each aikido training. You can rinse your aikido-gi in a cold water thoroughly. 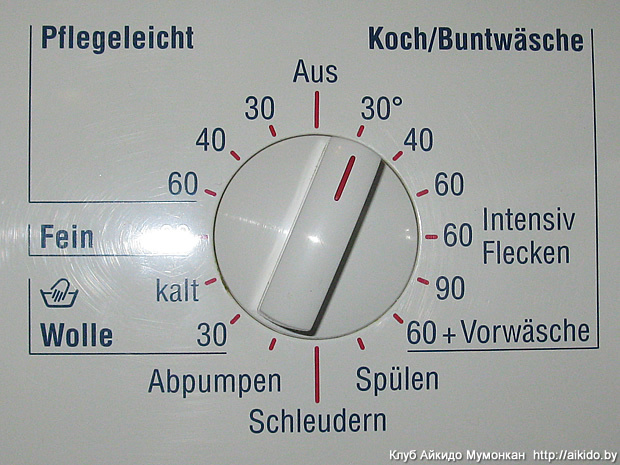 In this case, you can reduce the number of machine washings, but not less than one up to 2-3 times a week. You can put on a white cotton T-shirt under the kimono. The T-shirts absorb a significant portion of sweat. So, you can wash it with boiling more often than the kimono and should not worry that the fabric will deteriorate quickly. Do not neglect cleaning the dojo before training: it is easier to wash the tatami than to look for a way to clean the kimono afterwards. The expensive models of the kimono are usually made of a pre-bleached fabric. 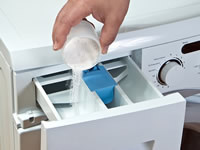 This eliminates the need of bleaching chemicals in the washing process. The cheaper models acquire a yellowish or grayish colour over time. So you will need bleaching to get back the original white color of your kimono. Bleaching is a chemical process, the principle of which is in adding specific substances to the water which increase the alkalinity of the detergent solution. The alkaline destroys fats found in dirt. It is believed that such additives do not harm the fabric because the cellulose the cotton fibers consist of is resistant to alkali. Nevertheless, it is recommended to use bleach only in the exceptional cases, when you need to refresh your kimono or get rid of stubborn dirt. Do not use bleaches containing chlorine (Cl) – they can weaken the fabric. If washing with bleach does not give the desired results, then you'd better go to the dry-cleaner's to remove the stubborn dirt. The kimono emits a smell due to the waste products of the millions of bacteria that can actively multiply on your aikido-gi. What can you do to get rid of this awful smell? 1) Never leave your kimono in your bag after trainings. 2) Rinse your kimono in cold water after each session. 3) If the smell remains, add 3 or 4 tablespoons of vinegar into the water. But do not overuse it. 4) Wash the kimono with detergents with fragrances, or add softeners. 5) If you are sure that your aikido-gi will not shrink, wash it periodically at a high temperature. Most bacteria perish at a temperature of +60°C...65°C. 6) Air your kimono in freezing temperatures in the winter time. Shake your kimono up after you take it out from the washing machine. The small folds formed during the washing will straighten themselves, but straighten the large ones with your hands. Hang the jacket on a hanger, and you will not even have to iron it after it dries out. It's better to dry the kimono outdoors. Since clothes are getting dried in winter longer than in summer, your kimono can still be wet by the next lesson. The ideal solution would be to buy a second aikido-gi for change. If you cannot afford a second kimono, then you will have to dry it in the apartment in the winter time. You are recommended that you should not dry it on a radiator or in a clothes dryer. It makes sense ironing the kimono only if it is made of the fabric with a smooth texture. A woven kimono does not need it, especially if you dry it properly. What does Mumonkan Aikido Club emblem mean?